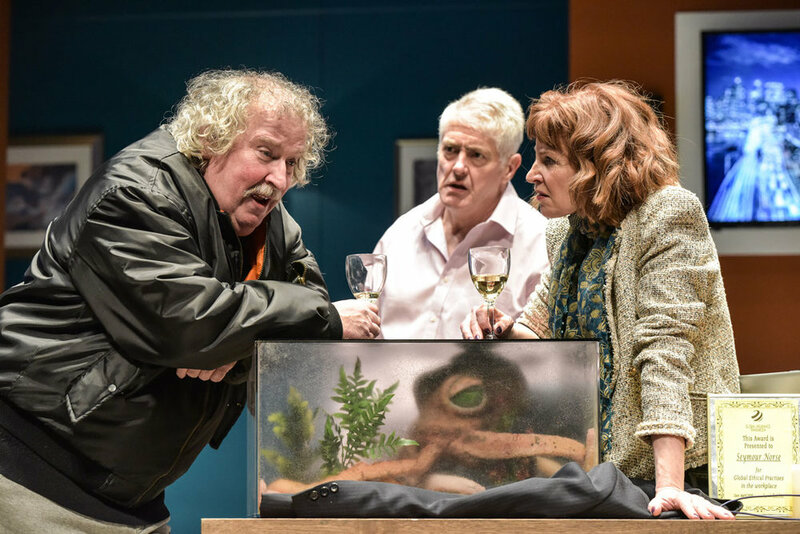 Jack Milner and Mark Stevenson’s new comedy farce, Octopus Soup! arrived at Cardiff New Theatre on Tuesday evening and was greeted with abundant laughter from an audience consisting of late teens upwards. Octopus Soup! follows Seymour (Nick Hancock)) an insurance consultant whose career rests on one important conference call. Unfortunately for Seymour, his plans are interrupted by bungling burglar Marvin (Paul Bradley). Chaos ensues as Marvin’s criminally inclined plans clash with Seymour’s conference call, resulting in an unlikely partnership sealing a deal between the pair coming to fruition thanks to the arrival of Seymour’s neurotic actress wife, Gloria (Carolyn Backhouse). Paul Bradley, Nick Hancock and Carolyn Backhouse in the comedy farce, Octopus Soup! which runs at Cardiff’s New Theatre until April 13, 2019. From the offset, Octopus Soup! is a study of the misunderstandings and misapprehensions that make classic farce so enjoyable. It even features a few visual trouser jokes (although these are quickly dispensed with in a trouser press to make way for a far more original twist). Milner and Stevenson’s script is delivered to perfection by Nick Hancock and Paul Bradley who both work together with expert comic timing, putting much in the way of fun and energy into the performance. Bradley’s easy delivery of wordplay for a character who doesn’t know his negligence from a negligee or Righteous Brothers from the Wright Brothers is great fun, while Nick Hancock’s slow-burning meltdown as the scenario around him gets more impossible generates sympathy and hilarity from the audience. Carolyn Backhouse in the comedy farce, Octopus Soup! which runs at Cardiff’s New Theatre until April 13, 2019. There is strong support from Carolyn Backhouse as Seymour’s prosecco-sipping wife Gloria, who gets some wonderful moments on stage from displaying her characters method acting as a North East Crime Officer to having a major meltdown at the dinner table. The arrival of Virginia Whale (Boss of GIT) played by Gillian Bevan and underworld boss, Alan (Eric Richard) both make room for further misunderstanding and misinterpretation, resulting in a sense of underlying menace as both of their characters agendas are exposed. Their power makes them the victims of the farce in the second half and both actors appear to lap up the fun with dialogue and slapstick. Richard is particularly fun to watch and his character here is a stark contrast to his much-loved portrayal of Sgt Cryer from the TV series, The Bill. Gillian Bevan, Nick Hancock, Carolyn Backhouse and Eric Richard in the comedy farce, Octopus Soup! which runs at Cardiff’s New Theatre until April 13, 2019. Finally, there is Marvin’s pet Octopus, Terry who adds a little more than a surrealistic edge to the unfolding plot. An Octopus certainly has the edge on a pair of trousers for this 21st Century farce! With meltdown’s, madness and mayhem for its ingredients, Octopus Soup! has a recipe for deserved comedy success as it continues its UK tour. Octopus Soup! runs until April 13 at Cardiff’s New Theatre.